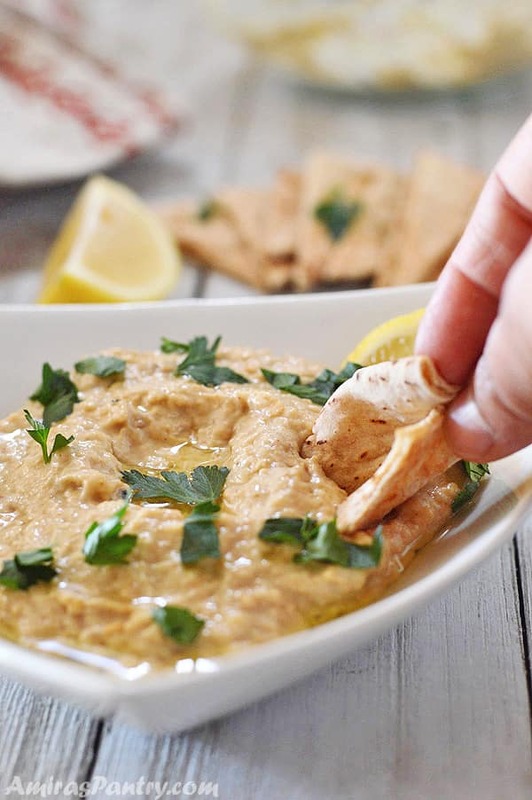 The ultimate baba ganoush recipe is simple but results in a rich, smoky and irresistible dip that is insanely delicious. This is one of my favorite Mediterranean dishes. Baba ganoush also baba ghanoush is a recipe that almost everyone has his own favorite version of. This is a basic recipe you can start with, I will include add-ons at the end of this post so you can play with the recipe as you like. I grew up to a father who was crazy about eggplants, really, my late father used to love eggplants in almost any form, and baba ganoush was not different. I’ve had Baba Ghanoush for dinner, breakfast and even as a snack with some bread. For Egyptians, it is there as a dip, or as we like to call it salad, to accompany our meals. From kebab, kofta, grilled fish,to foul and falafel. You might be wondering why we are so crazy about baba ghanouj? I’ll tell you what is in Baba ghanoush so you can understand. Of course first ingredient is eggplant, smoky roasted delicious eggplant, along with tahini, garlic, lemon, olive oil and some spices. What culture is Baba Ganoush? The origin of this recipes, according to many Arabic websites, goes back to the first century. Some say it originated in Lebanon, others say in the Levant area in general or in Turkey. Legends say, there was this priest named father Ghanoush, who was very lovable and kind. Many people loved this man and one of the villagers/students made this dish for him. Because he was so generous, he refused to eat it all by himself and made a feast of it. The good man invited the whole village and everyone loved it and so they named it after the priest “Baba Ghanoush” or Father Ghanoush. Pretty interesting. The main ingredients here is eggplant which is high in Vitamin B, E, fibers and anti-aging. Baba Ganoush is a waist-friendly delicious dip that provides a good amount of fiber, vitamins and minerals in few calories. How long does Baba Ganoush last in the fridge? In some rare cases, I’ve safely consumed baba ganoush that has been in the fridge for well over a week. We love baba ghanoush and it is very rare for it to last in our fridge for over 3 days. 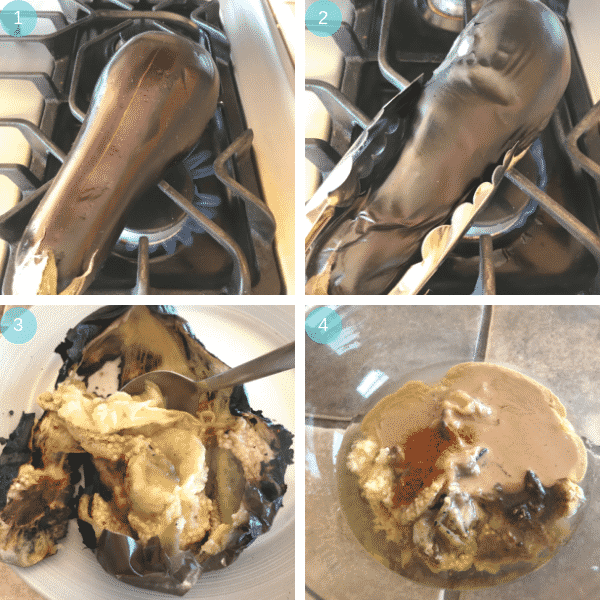 So Baba ganoush can be made a head of time, stored in an air tight container in your fridge for a week. What is Baba Ganoush eaten with? I love baba ganoush and have eaten it like a million times already. I can eat it with EVERYTHING. Dip it, spread it, spoon it… oh it is very good every time. Use it as an dip with carrots, bell pepper and cucumber sticks. Scoop it with pita chips or spread it on your pita sandwich. 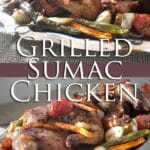 I love serving it with grilled fish, meats and chicken as well. Eggplants can be consumed if you are following a keto diet so as the baba ganoush. 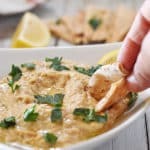 Actually baba ganoush is low carb, gluten free, keto and dairy free dip. Buying eggplants: let’s start from the beginning as this is extremely important. Look for small to medium eggplants as large ones tend to have more seeds and bitterness. Avoid blemished skin and look for shiny, smooth and little firm ones. Take a closer look at the stem, it should be green and free of mold. Eggplants should be heavy for their size which indicates more fresh flesh. Better to cook them within one day of purchase, just roast them and refrigerate if you do not have time to make baba ganoush at that day. Roasting eggplants for baba ganoush: Many people are confused about how to roast eggplant for baba ganoush. I grew up to a mom, grand moms, great grand moms, and everyone else in Egypt who roasted eggplants over their gas stove tops. It makes a wonderful, tender, smoky eggplant flesh. I can also suggest using your grill. But, if this is not your thing, for health or other issues, you can happily oven roast it whole and I saw others slice eggplants then broil. So you choose what is best for you, but for me I always do it that way even when I had an electric coil stove top. But do not forget to open the windows please . To drain or not to drain: Let me tell you that I’ve never drained an eggplant for baba ganoush. May be because I ALWAYS roast mine stove top even when I had a coil stove top. Eggplants drip their water while they are being roasted stove top or grilled. So if you broil yours in the oven you may want to let your eggplant drip in a colander doe 15 minutes or so. Using food processor: If my mom saw me using a food processor for baba ganoush, she will give me that look. But again this is a matter of personal preference. If you like yours super smooth, then use a food processor. For us, baba ganoush should have texture. Make a slit lengthwise in your eggplant with a knife but do not open it just a slit to release pressure. If you do not do that, the skin will burst and it will be hard to finish roasting the eggplant to its full potential. Using a tongs, turn it all around to make sure it is totally blackened. We need to get the whole thing blackened and shrivel. With a metal spoon, scoop all the flesh out, do not get scared if parts of the skin came in with you. This actually enhances the flavor and I like it. Place all the ingredients in a bowl and mix them together with a fork. You can use a food processor for this step if you like it super smooth with no texture at all. Now this is a basic recipe which means you can also tweak it a little and add either one or more of the following: small chopped onion, roasted then diced red bell pepper, roasted chilies, chopped parsley, pine nuts., roasted whole garlic on top. 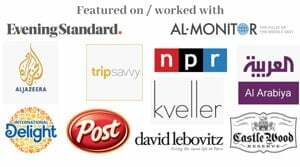 Some people also like to mix in a tablespoon of yogurt for extra creaminess.These are some of the add ons that Egyptian restaurants might serve. I actually like mine basic, simple, smoky and delicious. So if you want to wig out one day, make this traditional Mediterranean dip with a totally funky name and enjoy. Baba Ghanoush is a party favorite as it pairs very well with grilled meat, and frankly I find it pairs very well with almost anything. I would slather it to everything I eat even cheese! Yes, seriously I can have a pita pocket slathered with baba ghanoush and stuffed with cheese. CRAZY GOOD . 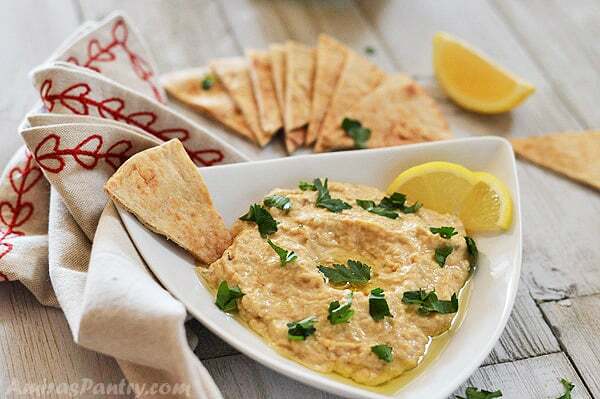 This is a basic recipe for the famous Mediterranean baba ganoush dip. 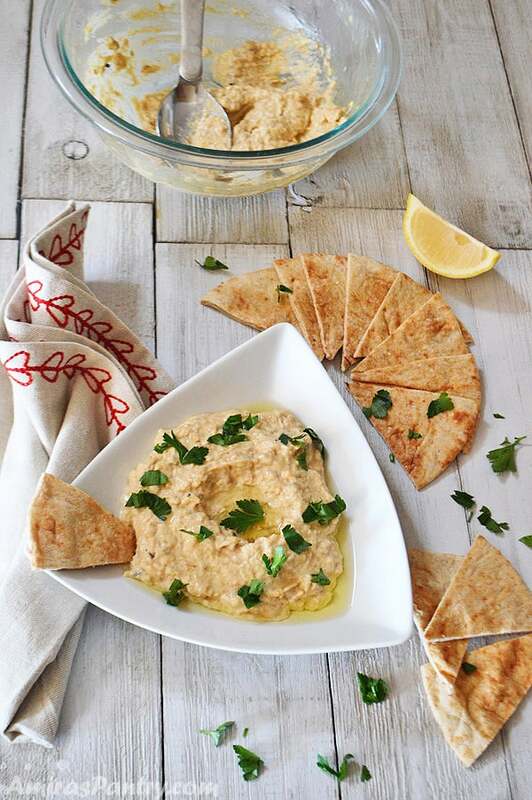 Serve as an appetizer with pita and veggies or as a side to your grilled meats. Vegan, Keto, gluten free and low carb. 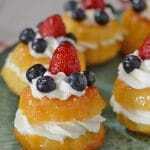 If you love this recipe please give it 5 stars! 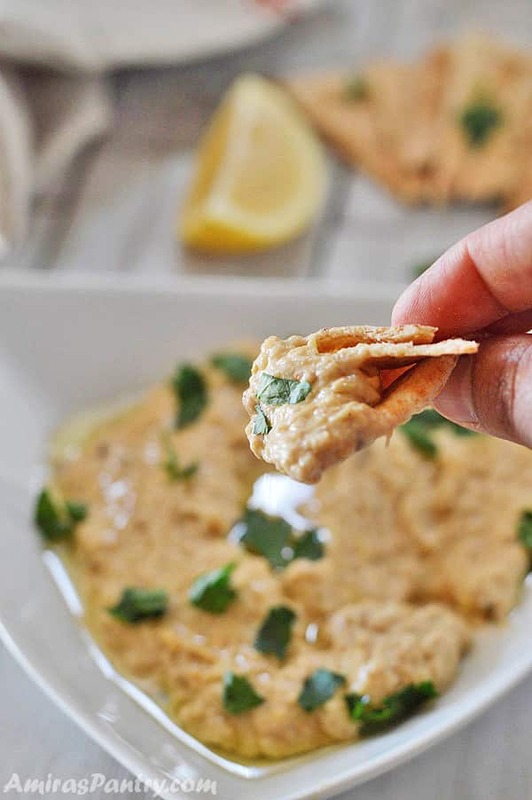 A creamy garlic-y eggplant dip that is very rich in flavor. 3 medium garlic cloves minced yields (1/2 Tablespoon). 1/8 teaspoon cayenne pepper optional. 1/4 cup chopped flat leaf parsley optional. When it is cooled enough to handle, scoop the soft flesh with a spoon and set aside in a deep bowl. Add all other ingredients, stir vigorously with a fork until eggplant breaks down into chunks and everything is well incorporated. Serve with pita bread or vegetables as a dip. Note1: You can add more tahini if you like it that way but start with 2 Tablespoons and go from there. Note2: You can cook eggplants using a broiler by placing the eggplant on a foil lined baking sheet, turn on the broiler to high and broil eggplant. Make sure to turn occasionally until it is well charred on all sides and tender. Please note: Nutrition facts does not include salt as it is to your taste. 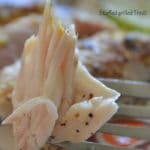 Great side detail adds to understanding of the dish. Thanks. I regularly make one recipe of Hummus and one of Baba Ganoush, combining everything in the food processor. Yummy and with your choice of dipping material, you have a full and filling meal. All the flavors blend well of course. Sometimes I add a heaping tsp (or more) of Za’atar. Yum, I love za’atar it fits everywhere in my daily eating. Thank you for your comment James. Some hot pita bread and a bowl of baba ganoushe is a perfect appetiser 🙂 This looks delicious! Yup, when I make this I roast the eggplant on the grill. Oven roasting works OK, but it’s just not as good. Terrific dish — nice and simple, and the flavors are so straightforward. Thanks!